WASHINGTON – The food of the future could be crawling up your leg. “Eating insects. I think it’s pretty cool,” said Mike Raupp, an entomologist with the University of Maryland. Raupp isn’t kidding. He prefers his cicadas fresh, and, yes, that means alive and kicking. But on Wednesday, Raupp spent his evening at the Royal Netherlands Embassy, cleaning, cooking and helping serve cicadas he rounded up himself. Raupp joined Marcel Dicke, an entomologist from the Wageningen University and Research Center in the Netherlands, to discuss the future of food. As far as Dicke is concerned, that future includes putting bugs on plates. “Insects are an excellent source of meat, and insects are the meat of the future,” said Dicke. According to Dicke, right now, 70 percent of the world’s land used for agriculture is dedicated to producing livestock. With the world’s population expected to swell from 7 billion to 9 billion, Dicke says there’s no way global agriculture can produce enough meat to feed everyone. Martin spoke on a panel with Raupp and Dicke and dished up some delicacies designed to prove that insects are not only great sources of protein and nutrients, they can taste great, too. 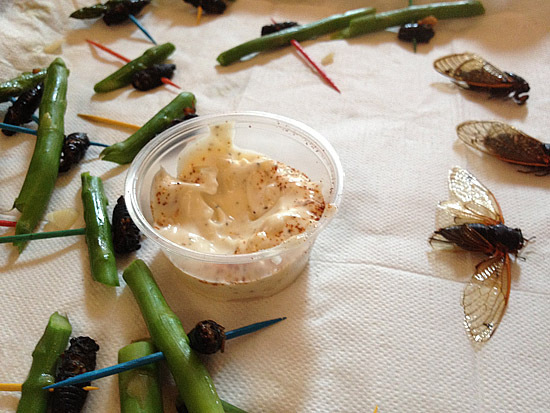 If anyone is skeptical, Martin says to consider this: Consumers are already eating insects. Anyone who’s gone out for pizza with their buddies has eaten bug fragments in the flour that formed the pizza dough and the tomato sauce topping it. Even beer isn’t bug free. Aphids love hops. So, for every 10 grams of hops used to produce a beer, figure in about 2,500 aphids. Dicke says insects have more going for them than being efficient protein sources. There’s the variety. “There are more than 1,900 species being eaten already,” said Dicke, so he says people will never get bored. Martin said she first got into eating bugs while she was researching the pre-Columbian diet in Mexico as part of her anthropology studies. Her first taste of bug was something called chapalina. But Martin kept testing and tasting along the way, and there are some things she won’t eat. 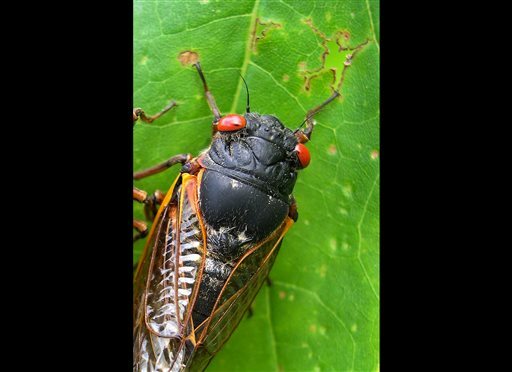 Submit your photos of this year\’s cicadas.